In the year 2023, France is governed by a dictator who rules with absolute power and an iron fist. Out of nowhere, a mysterious pyramid-shaped spaceship has appeared over France and has sent representatives to speak with the French government. 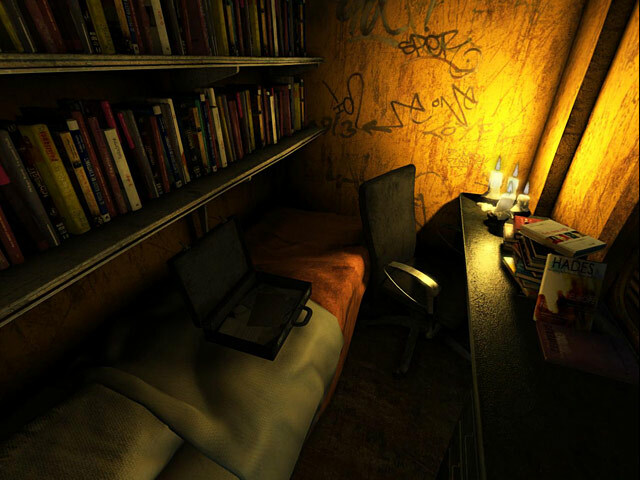 Help Nikopol piece together a dangerous conspiracy and find his missing father, all while exploring two completely different worlds in this Large File Adventure game. 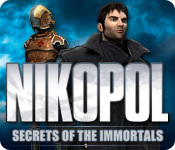 Nikopol: Secrets of the Immortals is rated 2.8 out of 5 by 8. Rated 5 out of 5 by coha92 from Like it! I like this game because it's totally different from what I played before. I love long file games although I have to look for walkthrough help sometimes. But it's worth to do it because you got to know the end of the story and learn more difficult puzzles, something that you don't see in any regular game. I Love the characters too and the fact that I was in danger so many times was something new for me. I had to be alert at all times to avoid beeing killed! I learned that I have to pay close attention at what Nikopol was saying to get a clue of what was coming next. If you like challenging, go for it! Rated 4 out of 5 by Sergeij from Held My Interest From Beginning To End! This rather unusual game by White Bird is very reminiscent of another White Bird game, "Sinking Island," and also reminds one of an effort by the Adventure Company, "Atlantis Evolution." Full of twists and turns and quick escapes, I found it quite intriguing, and even enthralling. This was a short game, but reminded one of the long and brilliant games of Benoit Sokol, the genius who managed to pull off such masterpieces as "Syberia," Syberia II (Syberia III is almost finished! ), and one of my all-time favorites, "Paradise." The game is a weird mix of ancient Egyptology, space travel, modern weaponry, programmed robots, and computers and computerized mechanisms. The storyline is a bit of a stretch, but, Alcide Nikopol, the protagonist, keeps the game moving and interesting. This game, as good as it was, was not on the high level of the above-mentioned games, but I enjoyed playing it and I thank White Bird for coming up with it, borrowing from the story by Enki Bilal. Rated 3 out of 5 by LucidDream from Pretty but confusing sci-fi adventure This game seemed promising at first, with it's excellent graphics and a story based on the graphic novels of the revered french novelist Enki Bilal. Unfortunately the game is too confusing to be particularly fun to play. On the positive side the graphics are in general excellent. 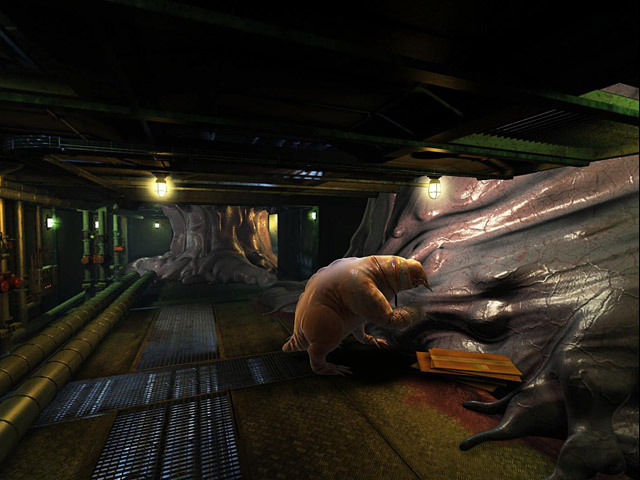 Sound effects are also used in a good way and the music add to the atmosphere of the game. Locations are well designed and look appropriately futuristic and dystopian. The two main problems with the game are the confusing story and the puzzles that often aren't well integrated with the story and that sometimes require a frustrating amount of trial and error, which is particularly annoying when combined with timed sequences. Apart from some frustrating timed puzzles and puzzles that require too much trial and error, there are also more interesting and logical puzzles which offer a good level of challenge. The story seems like it could be very interesting if it was more coherent. Unfortunately the information you are given is not enough to figure out what is going on and there seem to be large jumps in the story, almost as if the developers had chosen to include a few different parts of the graphic novels in the game without caring very much about making the story understandable for someone who is not already familiar with the source material. In conclusion I cannot recomend this game to anyone except if you are familar with the graphic novels and want an opportunity to explore parts of the world depicted in these novels. To anyone else the game is just going to be to confusing to be really enjoyable. 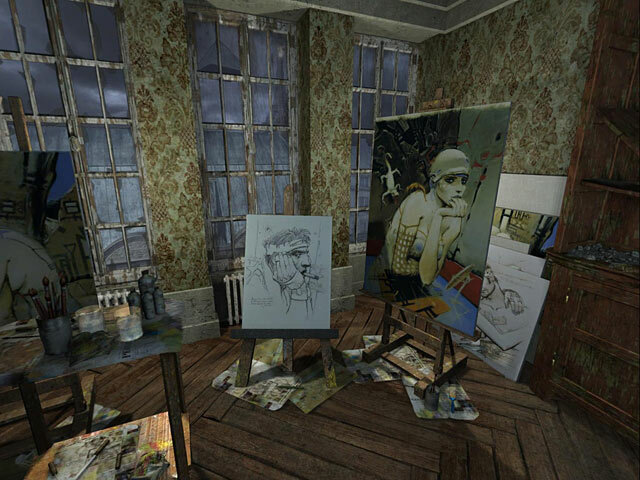 Rated 3 out of 5 by Lao_Zi from What a shame for Enki Bilal I am a huge fan of the work of Enki Bilal and Benoit Sokal, so I was really excited to see that White Bird had published a game based on the work of this extremely gifted graphic artist. But the game itself is very disappointing. Yes, the graphics are gorgeous in every way, but the gameplay and the storyline do not honour Enki Bilal, by far. The most annoying thing in the game is, that you get killed over and over again, trying to figure out what you should do in order to go on. If this is the way of the dev's to lengthen the gaming time of a game without real challenges, then it is a very tedious one. I would like to recommend the game for its graphic qualities, but I suggest you spend your money on the books by Enki Bilal... you will get so much more satisfaction out of it. Rated 2 out of 5 by oledood from Bad programming I expect more from Sokal. I loved his Syberia games. This game's interface makes me dizzy trying to follow the constantly shifting scenes, every time the mouse moves. The cursor ( an unbelievably tiny white dot) is often difficult to find and the constantly moving scenes are ridiculous. The discovery cursor is also tiny and made me angry. The so-called monster's ability to constantly ruin the game and cause it to have to be restarted is so irritating I finally dumped this game out of frustration before I managed to get out of the first scene. Shame on Sokal and his partners who programmed this erratic mess. Too bad I can't get my money back. Rated 2 out of 5 by upcountrygirl from Could have been brilliant but wasn't I'd already read negative reviews of this game elsewhere, but I thought I'd give it a try because I like true adventure games rather than HOGs, and I wanted to try something a bit different from the norm. At first sight it looks impressive: the graphics are very detailed and realistic and there's full 360 degree movement. It all seems very dark and dangerous, as you're in Paris in an alternative universe where everything's wrecked and some fascist dictators are in power. Also there's an alien pancake clinging to the outside of a skyscraper ... But it's not as good as it promised to be. The first thing you have to do - getting out of the flat - is so hard that I had to go to the walkthrough to find out how, and get someone to bellow instructions to me so I could do it fast enough. The cursor is almost too small to see. There aren't many different scenes to explore. Some of the puzzles seemed very hard, or at least they elicited the "can't be bothered" response. Rated 2 out of 5 by cwy2009 from Good-looking, but short; google for demo instead This good-looking futuristic cyberpunk adventure game is unfortunately too short. Supposedly a full-length game, it has only FIVE locations to explore: your apartment, an underground hideout, a patrol checkpoint, a tower (exterior and interior). Needless to say, the story, which sounds interesting at first, feels half-baked when you finish the game. The puzzles are not bad, but nothing memorable: you unlock this and that, decode this and that, operate machineries, yada yada. Bigfish doesn't offer a trial, so definitely google for the playable demo that is out there. Rated 1 out of 5 by nwind from You'll Love It or Hate It! This game is very different. Admittedly, I only made it through the first few screens but if you are into 360 degree (Plus up and down) scenarios, you will love it. The cursor is quite small and only appears when you scroll around and land on something you can act on. Since the game takes your entire screen, you will need to hit ESC to see your inventory. The format really sets this game apart and it looked like the story would probably be good but I don't like format so didn't really get into it. If you are more flexible than I am, you might just love it. Because it is such a different visual experience, I do urge people to download the trial before purchasing. A mysterious pyramid-shaped spaceship has appeared over France! Now, it’s up to Nikopol to thwart a dangerous conspiracy!